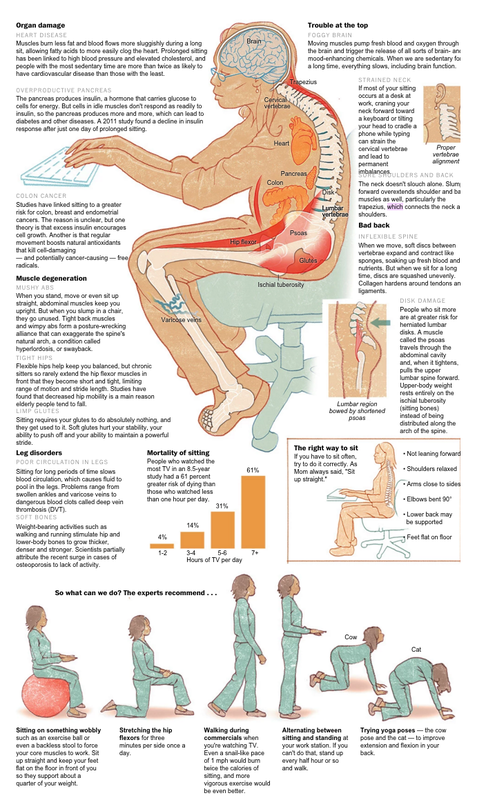 The Washington Post today has a nicely illustrated look at the health hazards of sitting. At the bottom you will see some tips from “the experts”. Approach these with caution! Sitting on a large ball as recommended is no guarantee that you will not slump and slouch into the same habitual position as in a chair. And the benefit of any exercise is completely dependent on how you do it, but there are no instructions provided regarding the how, nor are there any warnings regarding the possible hazards of doing them in a harmful way. Instructions for how to do exercises are frequently incomplete in that they just assume if you are told what to do, you will know how to do it in a healthy, coordinated way. That is really just magical thinking and not at all true. For example, very few people will be able to perform a hip flexor stretch as shown in the article in a way that maintains the easy balance of the torso. While stretching the flexors of the right hip they will unconsciously pull down the left side of the torso, resulting in a tightening of the hip flexors of the left leg. This is like taking one step forward and one step back, resulting in getting nowhere fast! It is of course possible to do all the exercises shown in a manner that is not counterproductive. But if you can do that, you probably do not sit in such a counterproductive manner that you need to do the exercises in the first place. Want proof? Book a lesson with me and I’ll show you. It’s easier in the long run to prevent the bad sitting than it is to repair the damage it does. Don’t collapse your back into a C- curve, because it restricts breathing. Collapsing the back produces in turn a collapse in the front, which restricts rib movement and breathing. One gets the most oxygen for the least effort from the floating ribs at the bottom of the rib cage. Collapsing forward restricts their freedom and much more effort is needed to use inappropriate upper ribs, and accessory breathing muscles. Don’t tilt your chin up so that you break the line extending from your spine. Feel how the balance of your head (which depends upon correct muscle tone), is very important in the overall balance of the bike; the more you can allow the weight of the head to be transmitted down through the column of the neck and the length of the spine into the saddle, the more stable the bike will feel. The head, neck and back are now working as one integrated unit. Let your legs do the work. Finally, keeping this sense of relationship between head, neck and back, allow yourself to pivot forward from the hip joints and then allow the heels of the hands to just support your weight on the bars. This is a poised cycling position. You soon appreciate that it is the legs that really must do the work. If the legs don’t do the work, the effort is passed upwards through the body. This will produce unproductive tension and tightness around the shoulders and arms, in the neck and jaw, and of course in the rib cage and the breathing. The head leads and the body follows: RUN TALL, not military tall but an easy up. The spine should lengthen in the body, not bend forward in the direction of movement. The forward lean should come from the ankles not from the waist. Thinking up helps the athlete breathe more naturally as well as preventing back issues. Lead with the knees not the feet. Alexander’s direction “let the knees go forward and away” is perfect for runners who want to reduce over-striding. Thinking of the knee leading, rather than reaching with the foot, encourages the runner to land more underneath the hip which helps to reduce braking and slowing momentum. Avoid ‘end gaining’! Focusing too much on results is a great way to kill the joy of running and competing. Learning to run well, train intelligently and compete with courage and passion will bring results and enrich you as a human being in the process. Researchers have confirmed what many Alexander Technique teachers have taught for many years. The human foot runs just fine without shoes. In fact, it runs better! They found that when runners lace up their shmancy sneakers and take off, about 75 to 80 percent land heel-first. Barefoot runners—as Homo sapiens had evolved to be—usually land toward the middle or front of the food. “People who don’t wear shoes when they run have an astonishingly different strike,” Lieberman said. Without shoes, landing on the heel is painful and can translate into a collision force some 1.5 to 3 times body weight. “Barefoot runners point their toes more at landing,” which helps to lessen the impact by “decreasing the effective mass of the foot that comes to a sudden stop when you land,” Madhusudhan Venkadesan, an applied mathematics and human evolutionary biology postdoctoral researcher at Harvard who also worked on the study, said in a prepared statement. But as cushioned kicks have hit the streets and treadmills, that initial pain has disappeared, and runners have changed their stride, leading to a way of high-impact running that human physiology wasn’t evolved for—one that the researchers posit can lead to a host of foot and leg injuries.